2070 - Photo: Ian Windmill. 55015 (D9015) "TULYAR" was present at the Rainhill celebrations for three days during May 1980 and was used to haul various vehicles in the cavalcade. On the first of the three days, Saturday 24th May 1980, 55015 is seen as it hauls electric locomotives 86214 "SANS PAREIL" and 26020. The event was to mark the 150th anniversary of the first trials for the Manchester - Liverpool railway, an event which saw George Stephenson's "ROCKET" chosen as motive power for the line, winning him the £500 first prize. Timothy Hackworth's "SANS PAREIL" was also one of the original participating trialists and replicas of both Stephenson's "ROCKET" and "SANS PAREIL" were built and used at the 1980 celebrations. 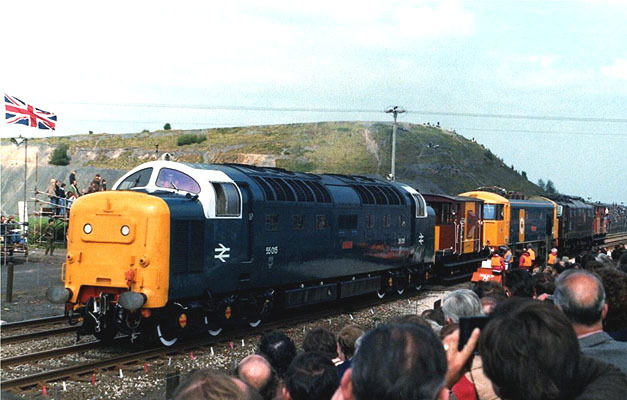 55015 was later fitted with plaques to denote its taking part in the prestigious event. 24/05/80 - Locomotive on display at Rainhill 150 Trials celebrations (hauling 86214 & E26020). Rail Portfolio No.3: Page 31. 24/05/80 - Locomotive on display at Rainhill 150 Trials celebrations (hauling 86214 & E26020). Tribute to the Deltics: Page 44.